A welding audit under the Transportation and Power Generation Accreditation Program was conducted on June 5–6, 2017. Welding audits are a part of mandatory audits performed in all companies supplying to General Electric. As of now, CKD Kutná Hora is the only European company possessing this certificate. There are only 21 companies in the world that passed the certification and have been awarded the certificate. It is valid for one year only; after this period, another audit by PRI-TPG will be conducted. No significant non-conformances were found during the audit; minor non-conformances detected will be rectified through corrective actions. 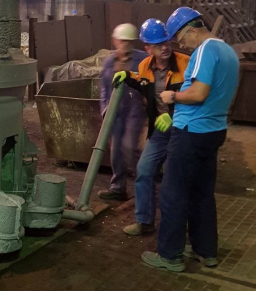 The last test piece for the General Electric series was successfully casted in May. This is currently the heaviest casting, weighing 10.5 tons! In early 2017, we received a contract from GE for production of five Wheel Hub test pieces. This is an important step for CKD in order to make a mark in the Off-Highway Vehicle sector. The OHV parts are designed for driving axles of mining dump trucks. The customer had set four months for production and final acceptance. Owing to all the people participating in design development, production, and inspection, we managed to shorten the deadline by ca 1 month. As a result of this, and thanks to the quality of our production, the customer has placed another order for these pieces.